Product prices and availability are accurate as of 2019-04-17 13:55:43 EDT and are subject to change. Any price and availability information displayed on http://www.amazon.com/ at the time of purchase will apply to the purchase of this product. 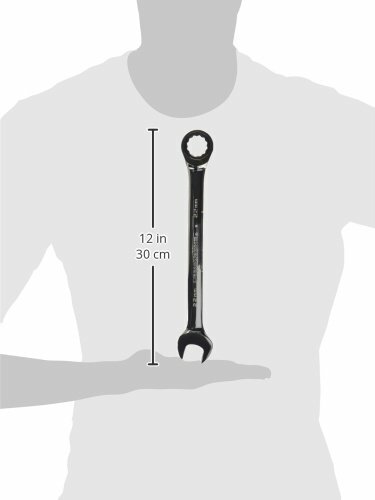 Gear Wrench -Feet's small ratcheting box end allows access to tight spots where a ratchet and socket or a conventional ratcheting box end will not fit. The Gear Wrench moves a fastener along any length threaded rod without ever having to remove the wrench from the fastener. Surface Drive box end virtually eliminates the rounding of fasteners. Metric Size(s) (mm): 22, Point Size (qty. ): 12, Combination Type: Open/boxed, Material Type: Fully hardened steel, Finish Type: Nickel-chrome Plated Mirror, Pieces (qty. ): 1, Ratchet Head: Yes.